What will I do at the end of the path? Eddie, one of my favorite girlfriend-senseis (hey, didn’t you see Karate Kid?) said something recently that stopped me in my tracks. It happened at our women’s Bible Study, a close-knit group of 6 longtime heart-buddies plowing through this life in Christ thing together. 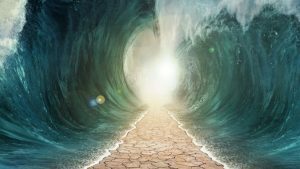 We’d been discussing the downright density of the Israelites after Yahweh had just just parted the Red Sea – an incredible miracle – so they could escape utter destruction at the hands of the Egyptians pursuing them. They hooted and hollered and pranced their gratitude, praising the Almighty God who could perform this marvelous intervention. Yay God! You go, Jehovah! Next thing you know, as soon as Moses went up the mountain to receive the Ten Commandments, they started looking for something tangible upon which to redirect their faith. Something – anything, it seemed – besides the Mighty Deity who’d already proven Himself. O ye of fickle faith. 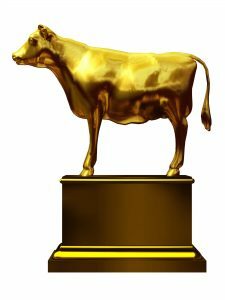 They chose a golden calf. A cow. Formed by human beings. Are you ever-lovin’ kidding me? I mean really, how dense can you be? 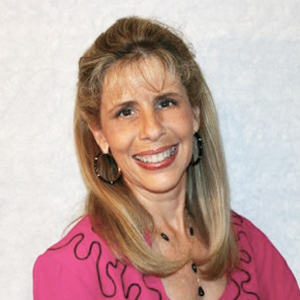 Eddie had just finished telling us about her recent revelation that Papa God had healed her years ago when medical tests first revealed a frightening problem and then suddenly, inexplicably they didn’t. New x-rays revealed that the problem was gone. Gone. Not unlike the waters of the Red Sea … there one minute, and gone the next. Wow. BIG wow. Don’t we all do that in our own way? I know for a fact I do. O me of fickle faith. I believe every one of us can look back in our lives at some point and see the undeniable fingerprints of Papa God moving in a miraculous way. Maybe not a life-or-death miracle … perhaps something more subtle – what I call a grace note, or everyday miracle (lots and lots and lots of example in my books). When [if] we recognize His intervention, we’re so grateful! Yay God! You go, Jehovah! But then when the darkness comes (as it inevitably will) and we’re facing a faceless, terrifying monster completely out of our control, instead of defaulting to trust in Papa God, we start flailing around, searching for a stupid cow to worship: Medical science; new drug regimes; laser treatments; breakthroughs in research. We’re as dense as those dang Israelites. As Eddie concluded, and all sincere Christ-followers must: Power is not in the tangible; everything you can hold in your hand can be stripped away. Power is in the intangible … the Spirit of the Living God. He is ultimately in control. Not us, the rate our heart beats, the texting driver that cuts in front of our car, the state of our bank accounts, when our livers wear out, or even hunks of metal shaped like cows. Eddie and I choose to forgo fickle faith; we choose firm faith. Even in the darkness. How about you, BBFF?